As queers, we are part of an international movement for human rights that encompasses the movement for Palestinian liberation, and all other liberation movements. We are also part of the growing international movement seeking active ways to express our solidarity with the people of Palestine. More. QUIT has regular bi-weekly meetings to discuss upcoming issues and plan actions. If you want to participate in these meetings, contact us for info by email to quitpalestine@yahoo.com. QUIT also maintains a listserve that sends out selected articles, updates and news items scanned from various sources. These emails, 1-2/day on average, area good source of information on Palestine and the Middle East. If you want to subscribe to this listserve send an email to quitpalestine@yahoo.com. Israeli Government Out of Our Film Festival! For the first time since 2007, the Israeli Consulate is a sponsor of the San Francisco International LGBT Film Festival. Queer communities have been targeted by the "Brand Israel" campaign as a receptive audience, and a useful cloak for Israel's oppressive policies. But we are not so desperate for acceptance that we will ally ourselves with racists and murderers. Thursday June 17, 6 p.m.
Queers Undermining Israeli Terrorism (QUIT!) is saddened and outraged to hear that Toronto Pride has banned Queers Against Israeli Apartheid from this year?s pride celebration. This type of censorship is shameful and unprecedented in the history of the LGBT/queer movement. For information about the wall, go to Stop The Wall. Apr. 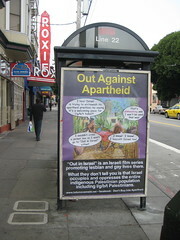 2009: Keep the Israeli Consulate out of the SF LGBT Film Festival. Video: Victoria's Secret Weapon Theater Company at the Folsom Street Fair! Advocate article on protest of "Yossi & Jagger"